I’m feeling the holiday crunch as I try to start/finish off holiday gifts in the next couple days. Thank you for leaving all your wish lists over the weekend! It’s fun to hear from you, to read what everyone wants and to see some of the same things repeated over and over. (more time, Liberty of London fabric, Japanese dress books – yes, yes & yes!) The winner of Twinkle Sews! is comment #51 – Tina! 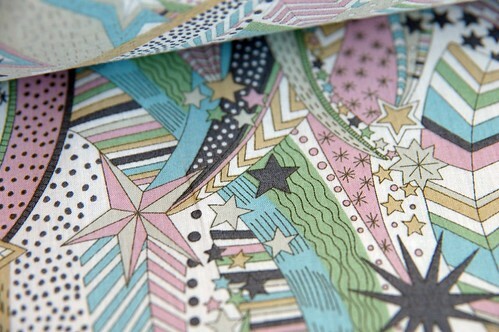 A Liberty print like My Little Star or Little Mari to make either a dress shirt or a summer dress. I can’t decide. 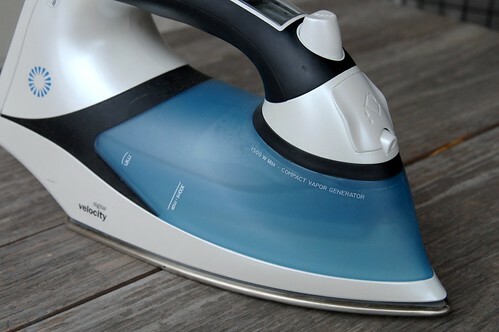 Reliable Iron – I got one for my mother years ago, but I am still using my old leaky iron. There’s only a few more crafting days left! Do you have any good last minute gift ideas? Leave a comment (with your email) by midnight tonight sharing your idea or a link to a great last minute gift idea and you could win a copy of Anna Maria Horner’s Study Hall Skirt. I’ll announce today’s winner tomorrow, with the next wish list! I’ve used Heifer International in the past for a quick and easy gift resource. Twenty dollars goes to a great cause – giving a flock of chicks to a family in need of betterment and sustainability. I donate in a friends name, and they have always received this well. It makes me feel good and them feel good, cause really, do we really need more stuff? Another quick and easy and super yummy thing to make and give are Rachel Rays Spicy Maple Walnuts. I do these every year and people always ask for more. I have to bag mine up tonight in fact. Maybe some special bags to keep bread (especially baguettes!) clean on the way home from home from the bakery. I really want to do this and print them with great bread quotes but I am running out of time fast. My last minute gifts are usually food related. A bag of caramel or kettle corn, a dozen favorite cookies (everyone talks about dieting but a dozen cookies only ruins a diet if you eat them all in one day). One year I took my lasagna recipe and split it among 3 loaf pans instead of a 9×13. I then froze it and gave one each to in-laws and single siblings. People who love homemade food but a whole lasagna was too much. 1. Preheat oven to 350 degrees F (175 degrees C.) Combine the flour, baking soda, and salt; set aside. 2. In a medium bowl, cream the butter, brown sugar, and white sugar until smooth. Beat in the egg and vanilla until light and fluffy. Gradually blend in the flour mixture, then mix in the coconut. Drop dough by teaspoonfuls onto an ungreased cookie sheet. Cookies should be about 3 inches apart. 3. Bake for 8 to 10 minutes in the preheated oven, or until lightly toasted. Cool on wire racks. I love to make hot/cold therapy bags, filled with rice, for the microwave or freezer. A bit of patchwork makes them beautiful and you can add a few drops of essential oil for a nice scent. Throw in some bath stuff and it’s a great gift. I’m planning on whipping up a few fabric cuffs like the ones at jchandmade.typepad.com for family that I’m seeing on the 27th. I’m going to make some quick scarves, one side is velvet, the other, a fun cotton print, I’ll sew them together, inside out, then T&T! My last-minute gift idea for crafty friends is 3 or 4 beautiful fat quarters, rolled up and tied with some coordinating ribbon or ricrac. Everyone loves getting something to add to their stash! 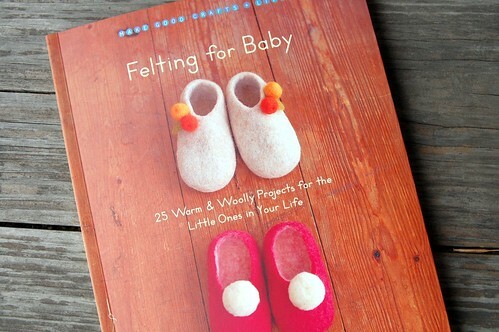 I just looked at Felting for Baby on Amazon’s Look Inside feature. Wow! What cute projects, and not all for babies–some, like a felt-covered vase for babies that would make a glass vase safer for babies, but really more for the grown-ups. It’s part of the Make Good: Crafts + Life translated-from-Japanese series that Linen, Cotton, Wool comes from. i’ve been making totes with suiting fabric (tweeds, pinstripes, houndstooth) on the outside and bold prints on the inside. and then put a monogram applique out of the lining material for a custom gift. it’s been going over well so far. and the project takes about an hour from start to finish! thanks for the inspiration you provide through this blog! Just read more closely and see that the comments request is for last-minute gifts. I plan to make a few sets of bias-trimmed placemats & napkins with funky fun fabrics similar to the ones on Purl Bee, maybe with hand-stitching. Also, a canning jar pincushion (see http://spt2.blogspot.com/2009/03/mason-jar-pincushion-tutorial.html) filled with a notions like few buttons & thread spools for my new-to-sewing daughter. Congrats to Tina! Hot chocolate mixes in mason jars topped off with marshmallows. You can get mason jars anywhere…grocery stores, dollar stores, wal-mart. Just tie a nice ribbon with instructions and tag…you’re good to go. I also like to knit or crochet small items which don’t take too much time to make. I’m giving nearly everyone I know a copy of Maira Kalman’s The Principles of Uncertainty. It’s beautiful, and thoughtful and untimately uplifting. And books are always a great gist, I think! I just made some quick tree ornaments for a friend’s daugheter’s birthday as a quick gift! I just took some old felted sweaters, cut out two circles, and then sewed them together with a ribbon tucked in between. I sewed a spiral pattern to make them really cute. It took only 15 minutes, including having two little ones underfoot. I was given a large bunch of rhubarb this weekend and so am turning into some lovely chutney for family members. My last minute crafting includes superhero capes (the puking pastilles tutorial version) for my two little boys… god I hope I get them done in time! I would love to try the study hall skirt, too! But not as a last minute gift, more as a slow and steady multi-evening kind of project just for me, me, me! Other last minute gift ideas – chocolates from Soma in the Distillery district. A favourite is their Spicy Mayan hot chocolate mix. So delicious! I made aprons for all my female family members this year. Aprons are so fun right now and not just for cooking. I have “crafty” friends who love to wear them when creating their latest art work and crafts. Such great ideas!! I need to bookmark these for when I have more time! Ha. So I’m making pot holders as a last minute, knitting some dishcloths for my mum, and making a big batch of rosemary maple nuts (from Food in Jars blog = too lazy to get the link) for the hard-to-buy people. I’ll put it in canning jars with a fun fabric covering the lid. i just crocheted a headband for my aunt. it’s more of like an ear-warmer, i guess. but it only took about a half hour to crochet! Easiest thing ever — chocolate bark! Make it look pretty with dried cranberries, toasted almonds and bright green pumpkin seeds. Use good quality dark or milk chocolate. 1. Melt the chocolate in a heatproof bowl set over (but not in) a saucepan of gently simmering water, stirring occasionally. 2. Spread the chocolate evenly on a parchment-lined 9-by-13-inch baking pan and sprinkle with the nuts. Refrigerate until firm, about 30 minutes. 3. Break the bark into pieces. Keep at room temperature for up to 1 week. This takes no time at all and people have been loving it so far! Scores! I can cross another gift off my last-minute list with this book, plus a few supplies. Awesome!